Don't Fear That Expired Food : The Salt When food passes its sell-by date, it's swept from the supermarket shelf. But that doesn't mean it's unsafe. Some items, like canned foods, can even last years or decades after their expiration date. 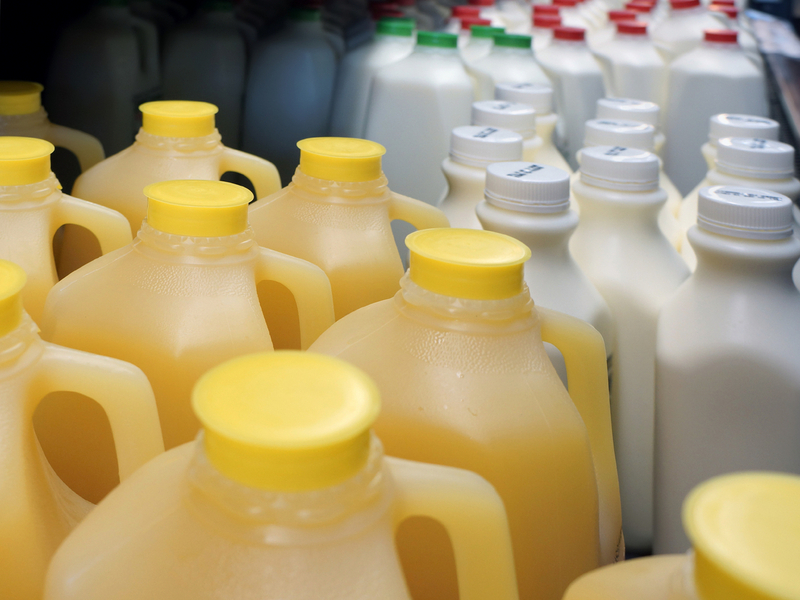 The expiration date on foods like orange juice and even milk aren't indicators of when those products will go bad. One of the places that knows most about the shelf life of food is a scientific establishment in Livermore, Calif., called the National Food Lab. At the NFL, they put food on shelves for days, or weeks, or even years, to see how it holds up. Sometimes, they'll try to accelerate the process with 90-degree heat and high humidity. And then, from time to time, they'll take some of the food — whether it's bagged salad greens, breakfast cereal, or fruit juice — off the shelf and place it in front of a highly trained panel of experts who check the taste and smell and texture. "You would think that everybody can taste and smell food, but some of us are much better at it than others," says Jena Roberts, vice president for business development at the NFL. The lab has 40 of these food tasters on staff. "They are the most fit people in the group," says Roberts. "Because they don't eat the food. They expectorate it. Which is a fancy college word for spit it in a cup." The experts give the food grades, in numbers. The numbers go down as the food gets older. Bread gets stale. Salad dressings can start to taste rancid. John Ruff, president of the Institute of Food Technologists in Chicago, says the companies that sell this food take a look at those grades and decide where they will draw the line, to protect the reputation of their products. "If the product was designed, let's say, to be a 7 when it was fresh, you may choose that at 6.2, it's gotten to the point where [you] don't want it to be on the market anymore," he says. "If it's 6.0, would most people still find it reasonably good? Absolutely," he says. "But companies want people to taste their products as best they can at the optimum, because that's how they maintain their business and their market shares." This is all organized and carried out by food companies; there's no federal law that requires dates on any food except for infant formula, although some states do require sell-by dates on milk or meat. Still, these dates don't really tell you anything about whether food is safe. According to Ruff, most products are safe to eat long after their expiration date. In fact, even meat or milk that's clearly starting to spoil is not necessarily dangerous. "Very often, you won't eat it because of the smell, and you probably won't like the taste, but in a lot of cases, it's unlikely to cause you illness," he says. Food doesn't become truly dangerous by sitting on the shelf too long. Ruff says that the real food safety risk is from food that's been contaminated with salmonella or listeria bacteria, or disease-causing strains of E. coli. Unfortunately, there's no way for the consumer to detect this. Contaminated food doesn't smell bad; it might have arrived in the store only yesterday. "In 40 years, in eight countries, if I think of major product recalls and food poisoning outbreaks, I can't think of [one] that was driven by a shelf-life issue," Ruff says. Canned food, in particular, can stay safe for a really long time. In 1974, scientists at the National Food Processors Association in Washington, D.C., got their hands on several old cans of food. Janet Dudek, now semi-retired and living in Vienna, Va., was among the scientists who analyzed this old food. Her assignment was a can of corn, vintage 1934, that was found in someone's basement in California. When they opened the can, Dudek says, the contents looked and smelled pretty much like ordinary canned corn. Analysis showed that it had most of the usual complement of nutrients — although there were lower levels of a few, such as vitamin C.
Results were similar for century-old canned oysters, tomatoes and red peppers in cans recovered from a sunken steamboat, buried in river silt near Omaha, Neb. Dudek says, as far as she knows, nobody actually tasted this food. That just wasn't done, she says. But they probably could have. "It would have been safe to eat if the can itself maintained its integrity," she says. When food in supermarkets passes its sell-by date, though, it gets swept off the shelves. Often, it's donated to food banks. Sometimes it's auctioned off. But if you discover such food in your pantry at home, there's really no reason to throw it out. Ruff says you should just sniff the meat and milk. If it smells funny, go ahead and toss it. But for most foods, don't worry. "As a consumer, I've certainly opened packages of food that were five years old."